When you first cracked the box for your Chromebook, it was new and snappy. But over time, it’s gotten sluggish and frustrating. If you’re looking to get more pep out of your Chromebook, here are some things you can do. Why Do Chromebooks Slow Down Over Time? Chromebooks have many benefits, but being immune to the inevitable slowdown most devices experience is unfortunately not one of them. Just like every other piece of tech, things are going to get gummed up and start to run more slowly as time goes on. Extensions: If you love to browse the Chrome Web Store for new extensions, you’re probably not doing the system any favors. The more extensions you have installed, the more things that are running in the background. Apps: This goes hand-in-hand with extensions. The more stuff you have installed, the more things will be eating up system resources. Downloads and Locally-Stored Files: Chromebooks typically have pretty limited storage, so the more things that are downloaded and stored locally, the slower the system will become as it gets close to capacity. The Web is Just Getting Heavier: This one is completely out of your control, but it’s an inevitable fact. The web is growing and getting more powerful, which means that the system has to work harder just to render pages. The older your Chromebook gets, the more of a problem this can be—especially on lower-end hardware. So really, it’s just like anything else. The more you use it, the slower it can become. The good news is that there are plenty of things you can to do keep your Chromebook running smoothly. Much like a Windows computer, Chrome OS has a built-in task manager. It offers a glimpse of what your system is current doing, especially in the moment. If you’re having sudden system issues, this is the best place to start. 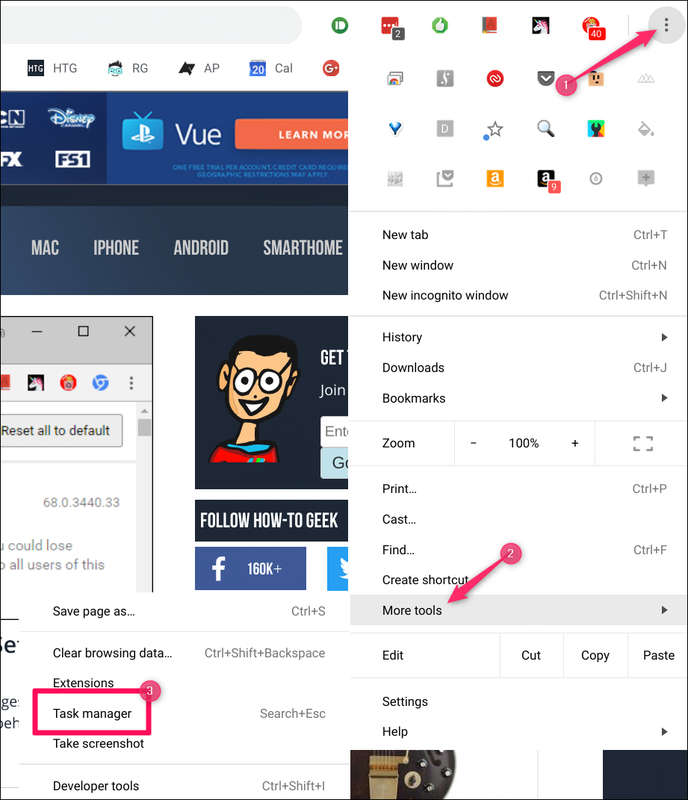 Click the Chrome menu button, jump down to the “More Tools” menu, and then choose the “Task Manager” option. You can also just hit Search+Escape on your keyboard. The Task Manager itself is pretty simple and straightforward. You can sort by by a task’s name, memory footprint, CPU usage, Network usage, or Process ID. Since CPU usage can jump pretty often, I suggest starting with memory usage. If your system seems bogged down or it’s slow to switch between apps/tabs, there’s a chance something is eating up lots of RAM. If it’s something you don’t need, shut it down to free up some system resources. After that, you can do the same for CPU, but keep in mind it’s going to jump around a lot and may not provide a lot of insight. 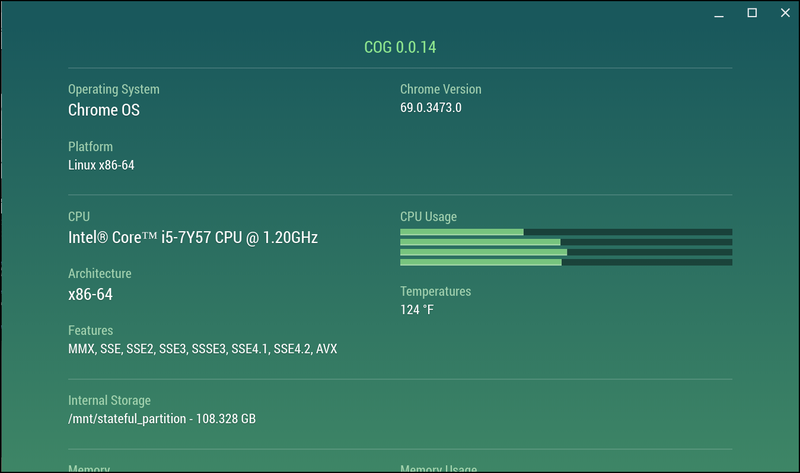 If something seems to stay along the top and is using a seemingly unusual amount of CPU, you may want to go ahead and kill it. To end a process, just click on it and then hit the End Process button at the bottom. Easy peasy. There’s also an excellent system monitor named Cog in the Chrome Web Store that can give a good overview of what the system is doing. I recommend using Cog and the Task Manager in tandem when trying to diagnose performance issues on your Chromebook.